WASSMER P., SCHWARTZ D., GOMEZ C., WARD S. & BARRÈRE P.
Palaeosinkhole features characterise the Maltese islands, some of them reaching relevant dimensions, especially in the Island of Gozo. They show varied morphostructures: sub-circular bays, large depressions and rounded buttes or mesas (due to relief inversion) are the resulting geomorphic expressions. A detailed geological and geomorphological study of the palaeosinkholes located in the NW sector of the Island of Gozo has been carried out with the aim of investigating the evolution of the associated landforms. A field survey and a mapping campaign at a 1:5000-scale, coupled with aerial-photo interpretation, has been carried out and a spatial database has been implemented within a GIS software. Existing evolutionary models have been critically analysed and new models proposed. Thanks to the detailed exploration of the collapse palaeosinkholes, it has been deducted that at a certain stage, selective erosion has become the main factor influencing their geomorphological evolution. Positive reliefs (rounded buttes or mesas) were formed where more resistant terrains were located inside the sinkholes; conversely, depressions and sub-circular bays developed where the sinkholes infill was surrounded by more resistant rocks. Collapse structures do not seem to be active at present and their activity probably ceased during the Miocene, suggesting that karst subsidence processes are not the only responsible for the final shaping of the above-mentioned subcircular depressions and bays. The Gozitan rounded bays related to the palaeosinkholes have been compared with similar sub-circular coastal landforms located along the southern coast of the Island of Malta. The investigation showed that the latter are not caused or influenced by karst processes, but linked to the attitude of strata and to their different resistance to erosion. The bays analysed in Gozo and Malta are morphologically similar but genetically different, representing a relevant example of equifinality. The Gozitan sinkhole-related landforms have also been compared with those of the Island of Malta, generally much smaller in size, which allowed their different geomorphological evolution to be pointed out. SOLDATI M., TONELLI C. & GALVE J.P.
ROUSSEL E. & ANDRÉ M.-F. The House of Turtles is one of the Mayan buildings of the Uxmal site in Yucatan. It has been erected during the Terminal Classic Period (AD 890-915), abandoned around AD 1050, and restored between 1969 and 1972. This monument was selected to quantitatively assess the impact of contemporary restoration practices on limestone weathering. Based on archival research and multi-scale photogrammetric surveys, weathering rates were calculated for two periods, covering respectively almost 1000 years (1050-2012) and 50 years (1972-2012). Whatever the spatial scale, whatever the construction choice, post-restoration weathering rates are systematically faster long-term rates: at the scale of the whole façade, stone recession has operated 38 times faster since restoration than on non-restored historical parts of the building (7.6 mm instead of 0.2 mm per century). This general trend is ascribed to the removal of the stucco coating that has protected limestone and delayed deterioration from the Mayan building times until the contemporary clearing and restoration operations. Another factor responsible for accelerated limestone decay is the replacement of wooden lintels by cement lintels, as indicated by the spatial distribution of deterioration hotspots on the façade and by the computed weathering rates obtained for six fine-scale windows taking into account the construction/restoration choices. This quantitative assessment leads to emphasise the need for softer, less intrusive restoration practices and conservation strategies, that should restrict the use of incompatible materials like cement and reinforced concrete, and consider stucco as a protective skin worth being maintained. 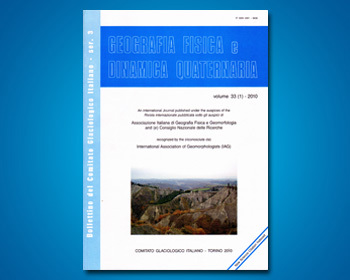 REYNARD E. & CORATZA P.
During the last two decades a renewed interest emerged in the scientific community for geoheritage, geoconservation and geotourism research. This was the reason for the International Association of Geomorphologists (IAG) for creating a specific working group (WG) on geomorphosites, that is the geomorphological part of geoheritage, in 2001. This paper reviews the main improvements made in the field of geomorphosite research during the period 2001-2012. A first domain of research concerned conceptual studies, in particular the definition of geomorphosites and the question of their value, as well as the links between geomorphological heritage and geodiversity. Some members of the WG also developed specific methods to assess geomorphosites and proposed guidelines for their mapping and the realisation of geoproducts. The work carried out during the last decade allows us to propose new perspectives, in particular on scale issues, the relationships between geoheritage and geodiversity assessment, the elaboration of guides of practices, and the integration with other disciplines (social and educational sciences, computer sciences, process geomorphology). RAVANEL L. & DELINE P.
Steep slopes form the marginal scarp of the semi-arid northern Brazilian «Nordeste», above depressions or corridors connected to a low erosion plain merging seaward with a coastal erosional-gradational piedmont. Dissected pediments and sparse debris fans visible at the base of some escarpments suggest recent erosive activity and possible slope retreat during the Late Cenozoic, although most of these forms are decoupled from major valleys. We describe the morphostructural patterns of chosen escarpments, in the crystalline basement as well as in the sedimentary cover, and the morphodynamic conditions of their evolution since the Miocene. Only a few scarps show strong structural control. Many of them are mainly inherited landforms, initiated during the Early Cretaceous rifting or the later margin uplift, a situation which suggests long-term stability. Later on, except in one case (the Araripe scarp), only slight or local backwearing took place, associated with downwearing on low surfaces and pediments, probably in diachronic ways. The Neogene clastic sedimentation on piedmonts and coastal areas mainly reflects the occurrence of dry periods inducing widespread stripping of deep soil horizons and erosion of bare rock slopes and surfaces. Dissection stages occurred in periods of more humid climate and/or low sea level. Marks of strong recent or present activity are mainly registered in the rims of the Chapada do Araripe, owing to favorable structural, hydrogeological and climatic conditions. The moderate volumes of Neogene clastic sediments imply overall low uplift and erosion rates until the Present, favorable to morphological and lithological resistance effects in the landscapes. However, slope instabilities are not uncommon, locally leading to well-characterized processes, landforms and deposits of gullying and mass wasting. Therefore, hazards related to slope processes should never be neglected, although only small-scale events were recorded in recent times, and times of recurrence of larger events are probably much longer than the historic times. PEULVAST J.-P. & BÉTARD F.
MADELIN M. & BELTRANDO G.
Spring frost damage in Champagne vineyard (NE France) is a major issue among growers. When this natural hazard is due to a cold air mass advection, frost protection methods are generally inefficient because low temperatures occur over the entire region. In contrast, this is not the case when freezing occurs in radiative conditions (clear sky and calm wind), when marked temperatures differentiation can be observed due to a complex interplay between wind, topography, land cover, etc. To better understand the spatial and temporal distribution of nocturnal minimum temperatures during radiative conditions, we applied the numerical model MesoNH and confronted its results to observed data (network of weather stations). In this paper, a particular night in March 2003 is examined, a period during which frost was particularly intense. We find that the model reproduces quite well the direction of wind flow, but it tends to overestimate the minimum temperatures for the coldest sites. Moreover, it gives a clear illustration of the interaction between calm regional wind and local breeze, and its influence on spatial temperature distribution. LAVIE É., LAGANIER R., MORÁBITO J.A., SALATINO S.E., MEDINA DE DIAS R., MIRALLES S. & HERNÁNDEZ R.
The province of Mendoza has a tradition of irrigation inherited from the Incas, from pre-Columbian times. It contains 36,000 ha irrigated and distributed in oases located on the banks of snow-glacial water-regime rivers from the Andes Mountains. After several years of monitoring the quality of irrigation water in two of the largest basins (Mendoza and Tunuyán rivers; latitude 32°30’S, 33º50’S and longitude 67°50’W, 69°30’W, respectively), this survey seeks to evaluate the quantitative and qualitative variations of dissolved (TDS) and suspended (TSS) solids in water flows. The study takes place in a context of decreasing water availability over short and long temporal scales (future scenarios of climate variability). Methodologically, the historical records of 12 strategically-selected sampling points (6 in each basin) were studied. The results show that the rivers and irrigation canals exhibit a good physical quality (turbidity and salinity) of the natural water used for irrigation. However, the combination of (i) a possible quantitative decrease in supply, (ii) an inadequate maintenance of the hydraulic structures due to regulation (clear water), and (iii) the negative impact of anthropogenic pollution (occasional industrial, domestic, and agricultural wastes, etc.) requires permanent monitoring in order to encourage effective decisions designed to preserve both the quantity and quality of the water for agriculture. Various erosion rate monitors have been exploited to evaluate the denudational history of the Orange River basin from the Mesozoic to the present. Extrapolation back in time from contemporary sediment loads is hazardous, even throughout the Holocene, and low temperature thermochronometry is unable to provide constraints on the recent cooling history, so that a gap cannot be bridged between a Cretaceous period of significant post-rift denudation and a recent acceleration of the human impact. In the first period the role of tectonics may be viewed as the driving force whereas cropland soil losses have dramatically increased through gully erosion during the last century. This paper highlights the limitations of comparing denudations rates over a long period of time as measurements of current processes appear irrelevant for interpreting long-term landscape evolution. Two ways of acquiring an understanding of landforms are to be considered as they bear evidence of an irreducible disparity between the tectonic and anthropic imprints.